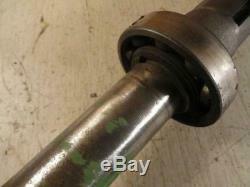 John Deere G 1 3/8 in PTO Shaft Part number F953R Used on John Deere G's after sn 43352 The shaft is not bent or twisted. The inner and outer splines are not worn. 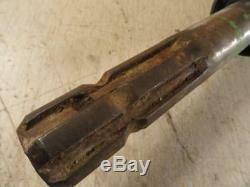 The key way for the hydraulic pump gear is good. The seal and bushing are fair. Please look at the pictures closely. 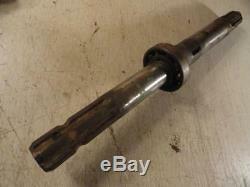 John Deere G 1 3/8 in PTO Shaft. 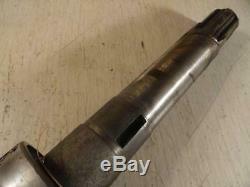 Part number F953R Used on John Deere G's after sn 43352 The shaft is not bent or twisted. Parts Inquiries and General Questions Welcome!! Specializing in John Deere Two-Cylinder parts, tractors, and repair MODELS A B G 50 60 70 520 530 620 630 720 730. Get images that make Supersized seem small. The item "John Deere G 1 3/8 in PTO Shaft Part number F953R" is in sale since Sunday, January 13, 2019. This item is in the category "Business & Industrial\Heavy Equipment, Parts & Attachments\Heavy Equipment Parts & Accessories\Antique & Vintage Equipment Parts". The seller is "greenhatpart" and is located in Niota, Illinois. This item can be shipped worldwide.